It was wrong of me to go with Duncan, but then the moons were never that beautiful before. Night after night we had talked, crossed swords of words on worldly issues and abstract philosophies, shared dreams and intimacies, but never away from the steps leading to my childhood home. “Something precious, something beautiful,” he said, a faraway look in his eyes. Of course I obliged. With a shy look up the stairs behind me, the heavy drapes of all the years gone by looming, I nodded and took his outreached hand. It was cold and comforting at the same time. Not a wind stirred but it being late Fall an icy atmosphere had invaded the world, and through this we walked close to each other. We crossed the silent streets, thread unknown paths and soon entered less civilized areas of the ancient city. A foreboding wilderness embraced our silhouettes as we kept moving through white shrouds of mysteries. Around us spectral hands of scrubs and wizened trees reach for a sky getting darker and darker; we have entered an edifice of nature so imposing I am overwhelmed by a feeling so intense it’s religious. Each step, each cold breath, magnified the two orbs watching us. The breath of my words crystalized every meaning of what I said. I couldn’t take my eyes away from those two moons, those mysterious existences of beauty. He held my waist and we started moving again. Feeling his arm and hand on my clothes was bliss. We started wading down, down into the swirling wonders before us, our gaze never leaving the eyes in the sky. I was almost out of breath. It was so unimaginably cold. He took my other hand, his firm grasp never leaving my waist in the process, and calmed me, steadying me. 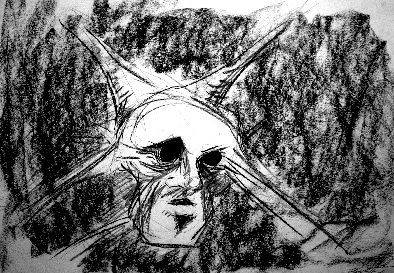 The orbs were increasing in size, blotting out all stars and almost all the hands surrounding us, in vain trying to reach above hell for forgiveness. We smiled. And then we kissed. It was wrong of me to go with Duncan. But it’s so beautiful here. A note: This story was written in one hour. It is unedited, and is an experiment based on me asking on Facebook for ideas to a great opening line. I received many great suggestions but this one sort of stuck. I am sure most of you have heard about one of the finest weird fiction writers of our time, W. H. Pugmire. He is one of the few who have managed to carve out his own niche on the basics of the writings of Grandpa himself, H. P. Lovecraft. He has a very personal vision, even if there is also a clear link to HPL, Oscar Wilde and other Pugmire favourites. On top of that he is a gentleman. 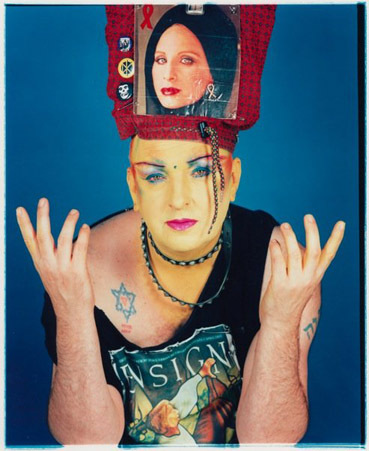 He is a Lovecraftian in the finest sense of the word. He has been a writer for quite a number of years, but in later yeras he seems to have reach a new, larger reader public — much deserved. Among his latest titles I can mention The Fungal Stain and Other Dreams (2006, Hippocampus Press), Weird Inhabitants of Sesqua Valley (2009, Terradan Works) and the aesthetic über-publication of them all, The Tangled Muse (2010, Centipede Press). The latter is a little out of reach for my pocket but I have a copy of the other two — and it really is some of the most decadent, poetic and dream-like strange writing you can find nowadays. The man is authentic. He is also quite the TV man! Don’t believe me? Then I urge you to check out his vlogs over on YouTube. He goes by the name MrWilum, and he is very generous with new material pertaining to all things Lovecraftian and weird writings. Thank you for being you, Mr. Pugmire. I apologize for the silence here on the blog. This odd thing called “real life” has demanded my attention. I won’t bother you with details. Speaking of websites… My webmaster and I have started working on a total revamp of the whole website situation. When I started H. Harksen Productions back in 2007 it made sense to have the two sites, hplmythos.com and hplmythos.dk. In a sense it still does, but my publishing projects nowadays count far more books not in the hplmythos Series so it has turned into quite a bizarre monster to behold… Too bizarre. So some time this Summer you will see a shift to an official H. Harksen Productions website surface. This will then be the main site — and will be with a much needed, improved buying cart and more. The hplmythos sites will still exist, of course, but they will revert to being what they were supposed to be from the beginning: Specialized sites for the hplmythos Series (two Series close to my heart that I intend to publish at a faster pace than what has so far been the case). And yes, when that happens they too will get a face-lift. Unfortunately the two books I have earlier told you would see publication in June or July will not see publication this side of August after all. John D. Haefele keeps digging up new, important material for his scholarly A Look Behind the Derleth Mythos: Origins of the Cthulhu Mythos, so it will be published for the Christmas Season 2011 instead. It’s going to be the largest book ever from H. Harksen Productions — in more than one sense of the word… As for John Mayer’s Hex Code and Others, we are still waiting for the final proofs of the title novella. The rest is ready to go, though, so you may see me write news of this book’s publication sooner than you’d expect;-) Before anyone start yelling to “just publish it” (we can all be impatient when it comes to books we just neeeeeeed) I want to say that one of the lessons I’ve learned is that a good proof editing is worth gold. While the result I have already is good, these finer detail corrections will make everything top-notch. And who wouldn’t want that, eh? Ran Cartwright’s Darktowne and Two Against Darkness by Ron Shiflet & Glynn Barrass are still on schedule. Still no specifics re. publication of Urban Cthulhu: Nightmare Cities, the 2nd Volume in my hplmythos.com Series. This depends on what deadline deals I can make with the artists. I’ll keep you posted. I know many of you are eager to see this one in real life (so am I!) but I want this too to be a top-notch work all the way through, so the wait will be worth it. The paperback publication of Strømsholt’s Danish De underjordiske is on schedule, and is officially published this Thursday, June 30. It’s going to be exciting to see if there will be some buzz in the newspapers… If any of you see a review, please tell me. In any case, for the first time ever I have managed to make a deal with local book stores here in Odense, so just about all of them will have the book on their news stand June 30! If any of you live in Odense I urge you to go and buy it from them; show them this is worth it! And now a little teaser… Already now I have two major book projects in Danish planned for 2012: One with the title Pix, and one with the title Ondskaben fra Alhambra. The former will be quite an interesting short story anthology and the latter will be the first novel publication from H. Harksen Productions. The sun is shining on Denmark with a vengeance these days. I’ve never been much of a “sun dweller” person, but this year I like it — even if I still have to retreat into the partly colder shadows when it gets too hot. I feel sad for the easter bunny. Must be hard in this weather… Good thing its job is now over, eh? Hopefully it sleeps cozily in some nice, temperate rabbit hole far from the dangers of the World and its burning light. 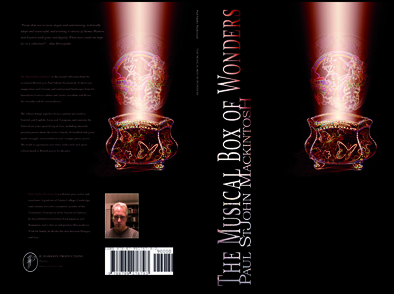 Paul StJohn Mackintosh: The Musical Box of Wonders (paperback, poetry) CHECK. You can buy this fine collection of beautiful poetry here: http://www.lulu.com/product/paperback/the-musical-box-of-wonders/15255859 . It will soon be found on Amazon.com and other venues as well. Also, PR material has been sent to various venues, so let’s cross our fingers for reviews, eh? John D. Haefele: A Look Behind the Derleth Mythos: Origins of the Cthulhu Mythos (hardcover, non-fiction). I have received the first batch of the final ms. from John. And the outline for the cover has also been created. Looking good. So things are progressing just as planned. Still aiming for a June/July release. Glynn Barrass & Ron Shiflet: Two Against Darkness (title subject to change?) (paperback, fiction). Eldritch Noir, written in a hardboiled Raymond Chandler style, and with the two protagonists embroiled in investigating the Cthulhu Mythos. This has everything from Herbert West to the King in Yellow. Tentative schedule: September 2011. Either way — that’s quite a packed and exciting publication schedule, wouldn’t you say? Thomas Strømsholt: De underjordiske. Gotiske fortællinger og sære historier (paperback edition, fiction). May/June release. Henrik Sandbeck Harksen (ed. ): Vol. 3 in the popular Danish hplmythos.dk Series (no title yet) (paperback, fiction anthology): Fall/Winter 2011. New Book: The Musical Box of Wonders by Paul StJohn Mackintosh — today! Daytime job commitments as well as sickness in the family etc. (yes, yes, “the mundane” demanding attention) have taken up all my time the last couple of weeks. That’s the reason for my absence. I apologize, but at least the worst is now over. Phew. This collection showcases imagination and lyricism, and confessional landscapes from the boundaries between culture and nature, mundane and divine, the everyday and the extraordinary. The volume brings together themes ancient and modern, Scottish and English, Asian and European, and contains the fruits of ten years spent living in Asia, including intensely personal poems about the writer’s family, all handled with great tactile strength, resourcefulness and a unique, poetic power. The result is a genuinely new voice, with a style and spirit seldom heard in British poetry for decades. Paul’s first collection, The Golden Age (1997) also received high praise — “This book alone strikes me as among the most distinguished by younger Britishpoets known to me,” said Michael Hamburger. To quote but one of many positive critics. So there’s hardly any reason to doubt that this new collection is worth buying. Also — to those horror afficionados among you readers out there, don’t forget that Paul’s story “The People of the Island” was one of the tales in the first volume of my hplmythos.com Series, Eldritch Horrors: Dark Tales (http://www.lulu.com/product/paperback/eldritch-horrors-dark-tales-%28hplmythoscom-vol-1%29/4708669 , or over at Amazon), to be highlighted with an Honorary Mention in Ellen Datlow’s volume 2 of Best Horror of the Year (2009, published by Night Shade Books: http://www.nightshadebooks.com/cart.php?m=product_detail&p=155 ).